Who among us hasn’t heard critiques of our churches like the one’s above? (Actually, how many of us haven’t uttered something similar?) Such criticism, while ringing with more than a modicum of truth, does not have to signal the demise of the church. What this does mean is that world we live in, the world we are working to transform by making disciples of Jesus Christ, is in a time of rapid change and for the church to remain relevant in this rapidly changing world, we have to “nimble up” and be willing to adapt the processes and programs that worked so well for so long to fit the changing times. Currently the conference leadership is exploring a tool that has the proven successful in other annual conferences at effectively energizing and equipping local churches as they take those sometimes difficult first few steps that change demands. This tool is known as the Healthy Church Initiative (HCI), Recently, Bishop Lowry, the Cabinet, members of the CTC Service Center staff and CTC Conference Lay Leaders Steve McIver and Kim Simpson participated in an HCI workshop designed to investigate and evaluate the HCI process.You’ll be hearing more about the Healthy Church Initiative as decisions are made on how, when and if to implement it. 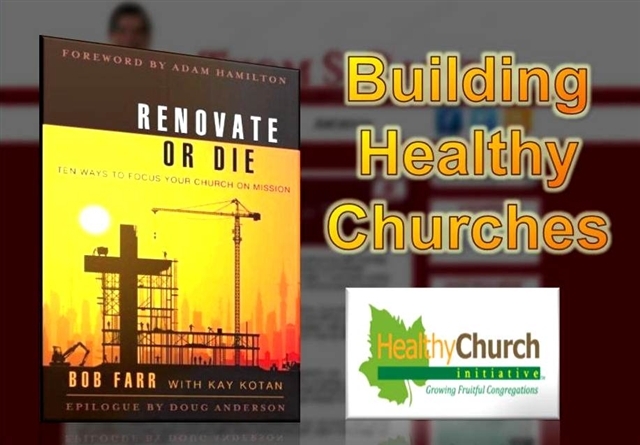 Along with our research into HCI, Bishop Lowry is also suggesting another resource for those looking to build healthy churches and congregations – Bob Farr’s new book Renovate or Die. 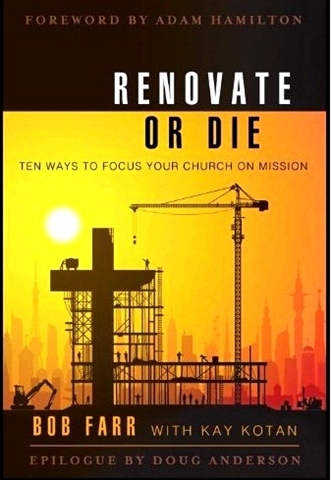 In his latest blog post, Bishop Lowry writes, “I am reading Renovate or Die. I commend it to you for its practical helpfulness.” Bob Farr is director of the Center for Congregational Excellence in the Missouri Annual Conference and a founding member of the Healthy Church Initiative. He has been a local church pastor, church planter and is a specialist in congregational change. If the title Renovate or Die sounds urgent – and maybe even a little confrontational – that’s because the situation, according to its author, is desperate. Churches who do not adapt to the current ministry context will die, and sooner rather than later. Those who do change, however, will be both relevant to the culture and faithful to their calling. Farr asserts that to change the world, we must first change the Church and he wastes’ no time in calling upon pastors to be the key leaders of change. This first of Farr’s ten suggestions puts the onus squarely on the shoulders of the clergy, calling them to move beyond the temptation to placate their congregations and instead lead with boldness and vision. The book then moves on to deal with broader church organization. These provide the building blocks through which the larger connectional ministries of the United Methodist Church can be strengthened.